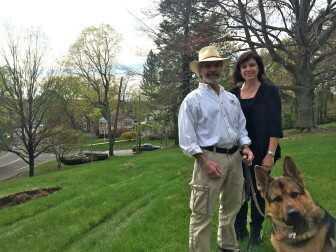 New Canaan resident Scott Gress lost 14 of the 80-foot pine trees on his property when Superstorm Sandy struck two years ago. 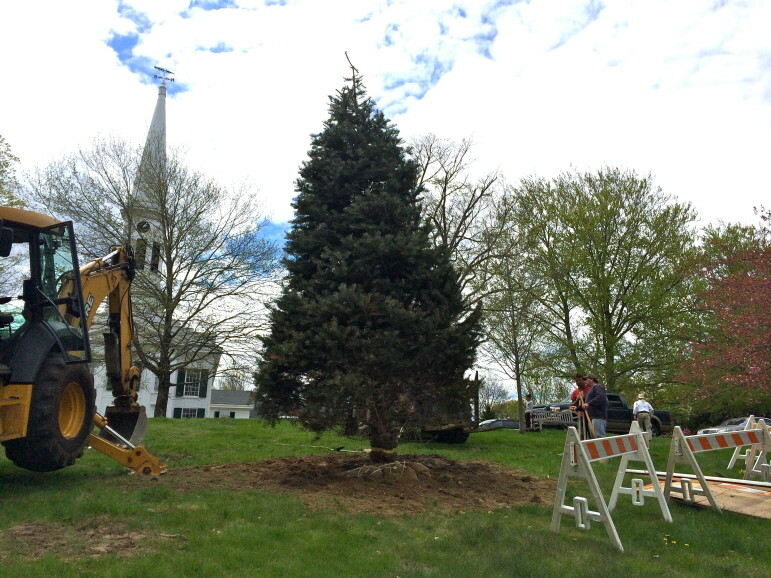 Shortly after, it occurred to Gress while driving past God’s Acre that if the iconic fir tree there came down, there’d be no centerpiece for one defining community event for New Canaanites: Christmas Eve caroling. Gress said he identifies New Canaan strongly with the annual Dec. 24 gathering on the sloping green in front of the Congregational Church. “There’s no question about it. When I was a little kid, we came here every single Christmas Eve and sang Christmas carols from the time I was six,” Gress said Tuesday morning as he stood near the newly dug hole where a Con Color Fir tree was to be planted within the hour. Passersby, town officials and a string of kids from Toddlertime Nursery School stood by on a sunny, warm and blessedly non-humid morning to watch a pair of front-loaders pull the tree off of a flatbed and slide into its new home. 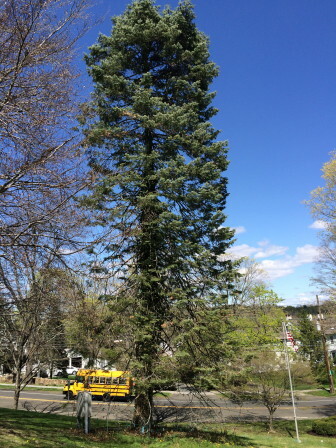 Officials say that in about 10 years, the young fir tree will serve as the centerpiece for Christmas caroling. A change on God’s Acre—particularly one that involves the cherished local caroling tradition—resonates deeply with New Canaan residents. 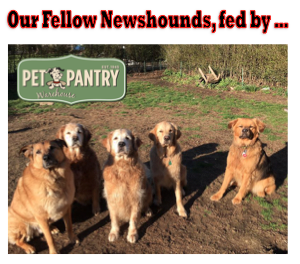 (Here’s one former New Canaanite who ranks the annual community gathering among her favorite things about the town.) The heart of New Canaan and center of the Historic District established June 27, 1963 by a group led by Judge Stanley Mead, God’s Acre itself is said by historians to be an ancient burial ground. It isn’t clear just how long New Canaanites have been caroling on Christmas Eve by the Congregational Church (website “godsacre.org”) which started New Canaan as a parish. Tree Warden Bruce Pauley with Assistant Tree Warden Bheema (“I post the trees, he marks them”) and Sonya Finch of Geiger’s. The newly dug hole for the 20-year-old Con Color Fir installed May 6, 2014 at God’s Acre can be seen behind them. 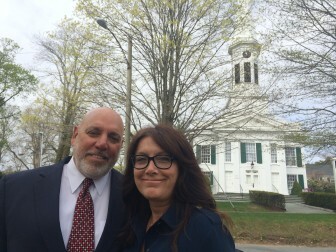 “It was a very old place for New Canaan and for the Congregational Church, and the bodies were moved to Lakeview and they are not sure that everybody was, so we still in many ways considered it to be hallowed ground,” Lindstrom said. This approximately 45-year-old fire tree for decades has served as the lighted Christmas tree during Dec. 24 caroling at God’s Acre. Known locally as “Church Hill” for more than 100 years, it is part geographically of a ridge that starts at the Long Island Sound shoreline in Darien (Hollow Tree Ridge) and runs continuously through that town (Ox Ridge), then through Waveny (where it crosses the old Norwalk-Stamford boundary, called the “Perambulation Line,” traces of which still can be seen in town), and along our present-day South Avenue corridor, through downtown New Canaan and up along Oenoke Ridge. Gress, a 1977 New Canaan High School graduate who moved back to New Canaan from New York City in 1991, two years after he and his wife had married, brought their Manhattan Christmas party with them. One year Gress, then chairman of the Park and Recreation Commission, decided that instead of bringing a gift, guests could bring a check. The thought at the time was to install grills at Irwin Park for the little leaguers to have a burger after the game—a plan that didn’t materialize. “The money has been sitting in an account, and we’ve been trying to figure out what to do with it,” Gress said. 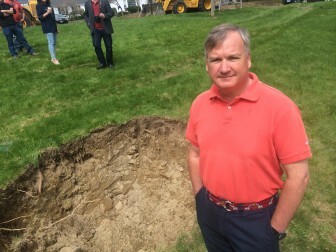 He reached out to First Selectman Rob Mallozzi (a friend and regular Christmas party guest) to find out about getting a new tree. Soon, Tree Warden Bruce Pauley was brought in, and Pauley got Mike and Suzy Covino involved. Pauley—2-year-old German shepherd dog Bheema (“assistant tree warden,” Pauley says, “I post the trees and he marks them”)—described the existing fir as a 40- to 45-year-old tree that’s fine healthwise. 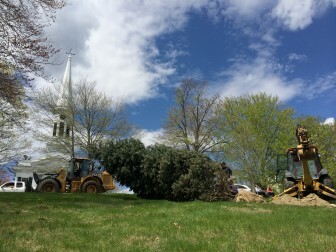 The new tree, about 25 feet high and 20 years old, is expected to grow well in what Mike Covino called “the bull’s eye of God’s Acre.” The fir is from Shagbark Farms in Hillsdale, N.Y., owned by his brother. Susan Covino described the Christmas Eve caroling as one of New Canaan’s most important community events.